In episode 5, we’re joined by Elijah Elliott from Red Hat Coffee based in San Diego, California. We discuss cold brew recipes, nitro coffee and the possibility of canning nitro coffee. We briefly discuss the current state of craft coffee and the Fourth Wave of coffee. We also briefly discuss Elijah’s background as a jet engine pilot and the potential for roasting coffee with a jet engine. Listen or subscribe today. The “Fourth Wave” of coffee. (We’ll further discuss the “waves” of coffee in an upcoming episode). Elijah’s brewing equipment and brew process at Red Hat Coffee. The possibility of roasting coffee with a jet engine. Hey there, welcome to episode five of the Drips and Draughts podcast. As always, I’m Brendan Hanson and I’ll be your host today. If you haven’t done so already, make sure you subscribe to the Drips and Draughts podcast in iTunes, Stitcher Radio, or in Google Play Music. You can find links to subscribe at dripsanddraughts.com. Today on the show I’m joined by Elijah Elliott from Red Hat Coffee in San Diego California. Elijah carved out some time in his busy schedule to join us today and called in from a market on the San Diego State University campus while preparing for his environmentally conscious construction course. Elijah and I discussed his introduction to cold brew coffee, his current brewing process and technique at Red Hat Coffee, nitro coffee, as well as canning nitro coffee, and we even talk about roasting coffee beans with a jet engine. So let’s get in to Episode 5 of the Drips and Draughts podcast which can be found at dripsanddraughts.com/5. Now here’s our interview with Elijah Elliott from Red Hat Coffee. Buckle up. So welcome back to the Drips and Draughts podcast, today we’ve got Elijah Elliott on the show from Red Hat Coffee down at San Diego. How are you doing Elijah? Elijah:I’m doing great, how are y’all? Brendan:Doing good, doing good. Elijah’s been a very active member in the Cold Brew Avenue Forums so he’s given a lot of great feedback and input in the forum so we thought we’ve have him on today. Elijah if you wouldn’t mind giving us a little background on yourself. Elijah:Yes sure so basically I’m coming up on 30 and since I got out of high school I spent five years in the Marine Corps traveling as a jet engine mechanic and then when I was done with that I entered into San Diego State as a civil engineer and while here I kind of got deeper into the coffee culture and through kind of a long journey that’s what spawned my company and really the goal of the company was to make enough money on the side of my engineering work to support my wife while she went back to school and our two kids and it’s kind of grown a little bit beyond that. Really, number one it’s been more of an infatuation than just a passion and number two it’s turned into a pretty solid business. I think it has a lot of potential to move forward and really make a name for ourselves in the fourth wave of coffee and that’s really the down and dirty of my last 10 years look like. We can dig into any of that as specific as you want to get. Brendan:Cool, so you’ve mentioned the fourth wave of coffee, what do you mean when you say that? Elijah:So the first and second wave of coffee are pretty similar and kind of just generic coffee as what you use to go to work. It wasn’t really a ton of focus on our artisanal work. You just woke up in the morning and chugged a cup of Folgers and took off. When you got into the third wave of coffee that’s where people started to discover more or there was more focus on coffee shops and the fact that there is artisanal and maker qualities of coffee and you can get different beans from different regions and people are starting to focus on that. The fourth wave is the shift from the artisanal movement being available only in shops to more of in e-commerce and social platform and moving into the digital age. At least for my view that’s what the fourth wave looks like and now we’re focusing on I think in the industry there’s a move towards focusing not only to how you can deliver coffee within a shop but how can I get this to your doorstep and get the same artisanal experience you’re getting within our little independent shops around the country, how can I get that into your house? That’s the fourth wave of coffee is personalizing the mass market of the coffee industry. Brendan:– now like cold brew concentrates can be shipped. Elijah:Yes absolutely and the cold brew concentrates I think are really obviously beans, I mean they’re not fragile. They’re pretty easy to push through the FDA so that market’s exploding and very easy for it to explode. Cold brew is really the last frontier as far as to your door delivery that’s left to figure out because of regulations that are put out by the FDA and of course by the state health departments that keep you from shipping dry in a box like you’d get from amazon or say if you want to get like a soda or something like that that could just show up without refrigeration. Brendan:Okay, that could be probably a totally different episode all together. Brendan:[laughs] That’s something we might have to talk about doing the future but getting back to you and your company. Where’d the name Red Hat Coffee come from? Elijah:That’s a great question. So like I stated I’m an engineer. I’m a civil engineer by trade working in a construction field and on sites everybody’s seen people wear hard hats right? Elijah:People wear different colored hard hats. They can mean one or two things, it can be a different level of experience or a different trade. In this case in my company that I work with, you wear a red hard hat in the first six months that you’re on the job and it shows to everybody number one, you’re brand new so “make sure this guy’s safe.” and all that kind of stuff so you’re brand new entering to the field but you’re also still being held to the same standard as the vets that have been around, right? Elijah Elliott: “Rough him up.” [laughs] absolutely, yes that’s not a small part of it and that’s what we are. That’s what Red Hat Coffee is, we’re a new entrant into the field of coffee but we want everybody to know that we’re building a product that’s just as good if not better than the veteran products that are already currently on the market. That’s what we’re shooting for, not some garbage amateur cup that hopes to one day be a competitor. Brendan:Cool, cool. So after six months, after your introductory period you’re going to turn into a Yellow Hat Coffee? Elijah:We might turn into Yellow Hat. Yes, I think we’ll stay Red Hat it stands out, people are pretty stoked on the name which isn’t super common in the business world, there is a couple of changes but for now it seems to work. Brendan:Yeah, I’ve seen some of your marketing and stickers and logos and it’s cool. It’s a cool design, it’s definitely different. Elijah:Thanks man. I really appreciate it, that was all on my back, not by choice but that’s the cheapest way in, it’s to do it all yourself. Brendan:Sure is, my brother and I bootstrapped everything we’ve done so, totally understand. Elijah:You guys have a really super solid thing going on. Super stoked to get you alls manual back before we kicked our company off and see that there was other people out there that were lit on cold brew and understood that there needed to be a legitimate industry forum and push for brotherhood like what’s in the microbrew markets. Brendan:-after we start kegging stuff, I got into what can we keg next? So next thing was coffee and my brother Cary and I, we just started running with that and started writing blog posts on Keg Outlet and we started getting tons and tons of feedback from people and questions and realized that there wasn’t really a great source for it. Elijah:There’s not and it’s unfortunate but realistically I think over the past five, ten years there hasn’t been a push for any kind of mass marketing if you even knew cold brew existed, the only place you’re going to get it is with some small hipster shop on the corner, you weren’t going to find it, mass market. So maybe that’s why there wasn’t a push but you guys are definitely on the forefront of building this network that has to exist. Brendan:Right. I think the cool thing about it now is seeing coffee pop up on draft, in different places whether it’s a bar, whether it’s a brewery. I’ve seen draft coffee on top of breweries now so I think going back to what you’re saying earlier about the fourth wave of coffee I think that’s probably another part of it. Elijah:Absolutely, the fourth wave is all about delivery and delivering to a broader market. Coffee used to be so specific, it was just for construction dudes or whoever’s waking up early then it branched out with the help of the Big Green Company, it branched out to “This could be an all-day deal.” And then in the 2000s well “This could be a college kid deal.” And now it’s “Everybody can enjoy it.” There’s so many different facets and the industry’s really making approach to show “Look, coffee isn’t just a black garbage or grandpa used to drink, there’s so many different things you can have with it.” And it’s really awesome. Brendan:Yeah, that’s one of my favourite parts about this whole industry is the story behind every company, every roasting company. Where the beans are coming from and it is an artisanship definitely. Elijah:Yes, it’s pretty beautiful. I’m really stoked to be a part of it. Brendan:Right on, so hey I got to ask you mentioned you were a jet engine pilot, do you think there’s any way you could rig up a roasting machine with a jet engine? Elijah:We could do it. I worked on the T64s and the last number I heard from somebody was that they are 1.8 million brand new. I think the new engine that’s coming out was somewhere near 2.4 (million) so if you’re looking to get like a really super-fast roast for a lot of money, we could do it. Brendan: So start-up cost would be a little high? Elijah:Little high, you might want to go on a shark tank to pick your money up. Brendan:But imagine the draw that would have that would bring a lot of people in just to see that happen. Elijah:Yes, you could hear the engine from a mile out. So, people would probably want to see what was going on [laughs]. Brendan:Right on. 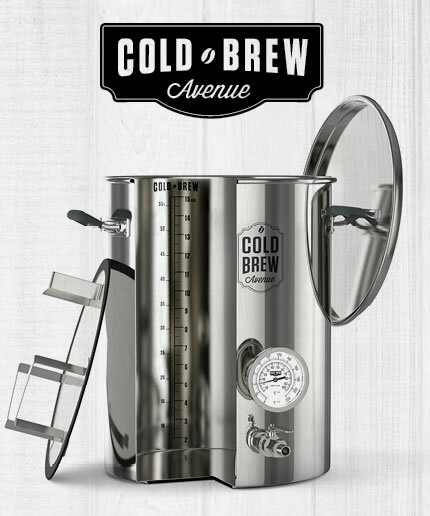 So, talking about the beans and the roast, how’d you get into cold brewing? Elijah:That is an awesome question. So, like I said, I was in the Marine Corps for awhile, you could imagine we had some really long days, so things like coffee and energy drinks were pretty readily available. When we were in Afghanistan, they used to ship pallets of energy drinks over there to keep you wired. I pulled 24-hour days regularly and the reason that you would drink those over the coffee is because it was just some sludge and being that I was as an amateur, I didn’t know that I was drinking it. It just tasted bad. Looking back, you’re talking about bags of coffee that had been there for years at a time, sealed up. So, they tasted just terrible. Then, I got back to the States and I went into college and just my demand for coffee didn’t go away. So, I was searching for a highly caffeinated product. I don’t know who we can and can’t mention but I came across Death Wish Coffee and I ordered up some of their beans and that was the first time that I had really learned (kind of by accident) that there a different world of coffee. There’s different beans you could get and it wasn’t all, whatever regular bean you see down at any local store. Brendan:Not sitting on a shelf for ages. Elijah:Yeah, just sitting forever. So, I got this bean and I said, “Oh my goodness.” To be quite honest, now that I had a ton of coffee, it’s not my favorite anymore but at that point, it really, really, really was. I said, “Oh my goodness. If I could find this bean, what could I find around here?” Well I’m in San Diego – Not only are we the IPA capital of the country but we’ve got a huge coffee scene. West Bean Coffee is downtown and they were ranked in the top 15 by Zagat, top 15 coffee shops in the whole country. We’ve got a bean out of a Bird Rock Roasters over in La Jolla that is consistently ranked in the top 10 in the country and they only roast over 90 rated beans. So, I just started going around and check out different stuff and when I went to my roaster, which is Dark Horse Coffee out in North Park, well now I roast at Golden Hill. They had cold brew and I tried it and I just loved it. Low acid, super smooth, you could get nitro there on tap, which is beautiful, and it lasts forever. I said, “Man, this is delicious.” I experimented. I was trying to make it at home and after a lot attempts, found a ratio that I was pretty down on and then tested that on my wife and my mom who don’t drink coffee and they’re pretty down on it. I said, “Hey, we probably got something here.” We moved forward. There was some other stuff behind it. Some failures that lead to some successes but yes, that was the long and short of how I came across the delicious world of cold brewed coffee. Brendan:It changed your life, huh. Elijah:It totally, totally, totally changed my life. I actually just wrote a message out to Death Wish to thank them for their indirect – you know, they had no idea but they were totally adjusting my view on coffee. Not only that, my view on what a small business could be and how we could build as a bootstrap company. Brendan:Right on. That’s cool that you said you sent a message to them for introducing you. I think that’s another one of my favorite parts about the craft coffee, craft beers, just the community sense that you get with it. Anybody you had talked to about coffee who’s doing the same thing is more than willing to talk about it, more than willing to share. It’s really, really a tight community. I think that’s probably one of my favorite parts of it. Elijah:It doesn’t end at the craft scene either. When I was very early on, trying to figure out should I can? Should I bottle? What does my stuff taste like? What does the world actually think of it? I sent my stuff out to every shop I could get my hands on. I sent my stuff to Stumptown, Cuvee, Cameleon, Devotion in New York. I sent my stuff all around the country and I said, “You guys are the coffee pros. Tell me is this good or is this garbage?” I got responses from each and every one of them to include Stumptown who’s the mac daddy of cold brew and is a, last time I checked, a $ 20 million annual revenue company and they reached out to me. They’re just still in the hairdresser shop that they started with back in Portland and I think it was like ’93 or ’94 something. So, the culture whether it’s big shops or little shops, the culture is so welcoming and inviting and we all just want to grow together and really make a solid industry and it’s super exciting man, super exciting. Brendan:I totally agree. I’ve worked in the beer industry longer than in the coffee industry but that’s one thing that I can say definitely transfers between industries. It’s just that sense of community. Brendan:So, would you mind telling us a little bit about your cold brew process? Brendan:Cool. So, let’s talk about maybe the equipment that you use, the grind type, and then maybe your ratios and steeping times if we’re not getting too specific there giving away any trade secrets. Elijah:No, that’s fine. You’d have to phone my supplier. You’d have to sit with my water and all that. So, I don’t think numbers really matter. Not to mention, you’d have to go through my FDA process which is probably way worse. So, let’s start with my equipment that I currently use. I use two 10 gallon buckets and a five gallon bucket from Coffee Sock which is a small family run company in Austin, Texas. They have commercial-sized stuff and then they have individual sized like mason jars. So, we use them. Then, inside of those buckets is a muslin coffee filter. I’d say we’re outgrowing that. We’re probably fixing this stuff up to stainless steel fermenter with a hop spider looped inside up in there, so we could pressurize and all that but that’s down the road. Currently these are the buckets that we use. We get our beans from a company here in San Diego, a big supplier. There’s two big suppliers. We get ours from InterAmerican. All of our coffees, every cold brew that we do from here until if we have a hundred flavors, every last one is single origin. So, we don’t blend our beans at all and the Cold Gold, our signature coffee we have out right now, is a Colombian Supremo bean that we get in and we roast, like I said, at Dark Horse Coffee Roasters here in San Diego and also up in Truckee. You should check them out if you’re near them. They have it all dialed in. Those are the only roasters we go to for Cold Gold. They have a very specific process. They get it to, I would say, just under a full city but I really see there’s just a little variation and that variation could make a flavor change. Then, we grind it out to just past a medium coarse. Not super fine. I don’t want dust because then I’m going to get over and trash in and it’ll taste like garbage which we’ve experimented with and it’s not fun. We cold filter all of our water. It’s just all straight regular California water that we filter through a couple of filters to get down to about five microns or less, put it in our buckets and we do, I’d like to think of it as a divide by 10 ratio. If I got four gallons of water, I’m going to do 40 ounces of coffee. Some people, that’s light. Some people, that’s heavy. We find that right in that neighborhood, is the most palatable for this particular bean, for this widest market. Brendan:So, are you marketing these or are they concentrates that need to be diluted or are these ready to drink bottles of coffee? Elijah:So, they’re ready to drink. I’ve had people have on every on each way. We got a guy in Texas who will only drink it by pouring it into a cup and microwaving it and drinking it straight which – to each, his own – not my cup of tea but that’s the way they do theirs but we also mix it with all sorts of stuff and then we’ll drink it straight. It’s delicious over ice. It’s especially delicious when we nitrogenate it and it’s really good to do a one-to-one or even a two-to-one with milk. Then, on the weekends, we like to mix it in Rumchata and cold brew it and it’s delicious. Brendan:Sounds good man, sounds good. I love all that stuff. So, 24-hour steeping time, you don’t find that you’re over extracting or starting to pull any acidity or bitterness out of that? Elijah:I would say we’re just getting to the front of the path where I’ve had some times where it sets for 25 or 26 and I’ve had to dump the batch because it just doesn’t meet up to my palate and if I’m noticing acid, I guarantee you that the market is going to notice the acid. They may not notice. What we found as in the market, they may not be able to say, “Oh, this is Colombian. This is Brazilian. This is whatever.” But they they’re definitely going to say, “Yes, this tastes like Copper.” That will happen. Brendan:These got some off flavors in it, sure. Brendan:Yes. I had a big batch that I did that I forgot about it and sat for 26 or 28 hours. I can’t remember now but versus my normal steeping time of 18 hours, it was entirely different. Elijah Elliot:I think it’s also important to note. It depends on what bean you’re using, right? Elijah Elliot:Just a millimeters difference in your average grind is going to make a difference and well, I can’t do that extra hour. So, all those factors come together where you got it from, what altitude it was growing at, soil content. There’s 10 million things but we just find that with our particular bean and our particular makeup 24 hours is perfect but literally one hour more and you’ll kill the batch. Brendan:It’s incredible. It really is such an art, it’s like talking to wine makers. Elijah: Oh yeah dude! And I come from a wine region up in Washington state and I remember thinking, what is it, viticulture. I remember a lot of our friends run wineries and grew up with their parents running wineries. And speaking viticulture from the naked eye from the outside, you’re just like yes, you stomp grapes. You put it in a bottle. Nah dude. There’s like way way more than that and it’s the same with coffee. Brendan: Sure. All right. So, you did mention nitro coffee as well. Are you currently doing nitro coffee? I know I’ve seen a couple of discussions in the forum about canning nitro coffee. You’ve been a part of those. Can you tell us about your nitro coffee? Are you currently serving it? Are you canning it? Elijah: Yeah. So, we actually just got approved for three farmers market here in San Diego and so we will be serving on tap at those farmers markets. We also make available to any customers, stores, bars, whatever. If anyone wants to set up tap and serve nitro in their facilities, we have that. We could set that up. So, we serve it on tap and we take our cold gold and we nitrogenate it. Now, what is, I guess I would say controversial is we use a 25-75 mix. And some people don’t like the mouth feel of CO2 I happen to think it’s good and we’ve gotten solid reviews but we are experimenting with our next bottle a hundred percent nitrogenation and seeing how that turns out. And I think it is going to be creamier but the nitrogen doesn’t actually mix atomically with coffee, so I’m wondering what it’s going to do. Brendan: It is a little tougher to get the nitrogen into the liquid. But we’ve done some experiments with CO2 and coffee and haven’t really liked our results so far. Elijah: And, you know, here’s the thing. We’re all brand new. So, I could be wrong. We could all be wrong. We don’t know. Elijah: And somebody said, “Hey, why not try laughing gas?” There’s 10 million things. Who knows in 10 years where we’ll be at? I saw somebody trying to shoot argon in. I have no idea. I just know right now we’re using 25-75 and this weekend will really be the proving grounds. We’re going to get the yea or the nay. And if it’s bad, hey, awesome, we’re a small batch. Brendan: On to the next one. Brendan: Right on. Cool. So, canning, is that something you’re doing currently? I think you’re one of the people who is looking into it. Brendan: And that’s kind of an elusive topic for a lot of the small batches, small companies. Brendan: Just because it’s usually pretty large investment. Elijah: So, to get into that market there’s two companies that make widgets, right? The Big Daddy Beer Company and the Big Daddy Beverage Containment Company, and the beer company you’re not going to get those widgets. So, you have to go to the Big Daddy Beverages Dispensary Company. They only serve it. And Europe is the only place you can get it so you’d have to have big budget to get it from there. And they’re fixing to come here in fall or spring and have cans over here. But the minimum purchase, like you said, the entrance is literally a truck load and I think it’s upward like 80 grand a purchase. That doesn’t work for a small company. I can’t even but I hope it works out. Brendan: Yes. That’s tough. Right. Elijah: So, we’re not going to go that route. But like I said, I’m an engineer. I have no problems cutting some out, and seeing how it works, and theorizing how I can make it better. And so, we basically got two routes. We can grow to the size where we can afford the space to store a truck load of widgets and personalized cans or we can engineer our own and go through our 3D printers here and get some prototypes in and make that so readily available to the small market who I think is ready to purchase at smaller quantities. So, it looks like in the next year when I catch time, we’ll be pursuing that second route, developing our own widget, getting a couple of 3D printers here at San Diego State to put out some prototypes, making sure it works and testing it on the market. And then putting it out there for all of us little guys to be able to purchase small quantities, group together, pick up and order. Brendan: Nice, yes. I hope you can keep us in the loop on that. Elijah: Oh, of course. Who else am I going to tell? Brendan: [laughs] And you know what, there might be a third option there for which I haven’t personally looked into too much. But I know that a lot of small micro craft breweries, probably not even micro, more nano craft breweries have the option to do mobile canning where they’re basically paying a company to come in and can the beer that they’ve made just because they couldn’t afford to purchase a canning system or bottling system. Elijah: Yes. Well, we will still, most likely use a mobile canning system. For one, then we don’t have to store a canning system, right? So, we could just have a mobile canner come through. But the problem is those mobile canners also don’t have widgets. So, you still have to develop the widget to store the nitrogen in. Brendan: Got you. So, they’re not able to provide the nitrogenated beverages. Elijah: Kind of. Is it okay if I walk through the process real quick? I mean there might be some people who don’t — I didn’t understand the widget until I really dug into it. Elijah: Okay. So, the way the widget works and this is in nitrogenated beers, nitrogenated coffees, all of those. The widget is any which shape but it looks like a little ping pong ball, with a tiny little half millimeter hole. And so, what you do is you fill up your beverage which you pressurize with nitrogen in a keg or in your fermenter or whatever facility, right? You shoot that into a can, an open can on the canning line and the canner will dose a small amount of liquid nitrogen into your beverage. You’ve got an empty widget sitting down in your beverage and they shoot liquid nitrogen down into that can. Well, liquid nitrogen gases of at just under -200o. So the second it goes into that beverage, it’ll go from a liquid to a gas instantly. And then, so you cap on foam. And what that does is that locks nitrogen in there. That liquid nitrogen is now looking for a place to go. It actually forces the beverage, whether it’s beer or coffee, forces that nitrogenated into the little widget. So, then you have a pressured difference between the widget and the outside air. And the nitrogen kind of groups up and slowly just sits in there, just like it would in a keg, in a super micro version of a keg, and nitrogenates your little beverage. Then when you pop the top on your can the pressure differential from the ambient air outside and the pressure inside the can is so different that the nitrogen wants to escape. And it literally rips itself apart from the beverage that’s inside the widget and shoots out. And that’s why you get all those bubbles instantly when you open that can. So, a mobile canner will have the liquid nitrogen dosing equipment. But if you don’t have a widget, it doesn’t matter. They’re going to throw it in there and that nitrogen is not going to have anywhere to hang out. It’s just going to flat out in the beverage or it’s going to explode your can. So, that’s the process that we have to work around. Brendan: Interesting. Yeah, I know a lot of people who’ve opened a Murphy’s stout or a can of Guinness. Sometimes you get one of those widgets that just seem super charged. You’re wondering what’s going on in there. Brendan: But they work, man. They do the job. Elijah: They work and it was a couple of scientists, and scientists is probably a pretty loose use of the word. But there’s a couple of beer guys in the ‘60s I believe. And literally, if you look at that thing for those listening who haven’t, it’s a thick ping pong ball with a tiny hole. It’s like the technology doesn’t look crazy but then when you explain it like, “Oh my goodness. How did you figure that out?” The answer is chemistry. That’s how you’d figure that out. Brendan: [laughs] Well, yes, that’s a little beyond my scope of understanding. So, hopefully one of these mobile companies can pick that up and start of like that. Elijah and Brendan: That would be awesome. Elijah: And somebody could make a kill in doing it. So, I don’t know why it took so long but maybe we’ll be the ones making the killing. We’ll see. Brendan: Yes. I mean, in the beer industry, I don’t know what the numbers are but the number of nitrogenated stouts are far, far less than just carbonated beer. So, I wonder with coffee coming up like it is if that’s going to be something that we see here in the next couple of years. Elijah: Yeah. Well, I’ll tell you this. We called around to something like 250 breweries here in San Diego. So, we have a lot of nitro here but it’s all nitro on tap. We called around from our information, from our calls, there is not a single brewery in San Diego that cans nitro because they don’t have the capability to do it. That’s 250 breweries in the country’s capital of breweries that don’t have the capability to can nitro. Brendan: Yes. There’s definitely some big names in San Diego as well. Brendan: That just goes to show that either the cost is a little beyond what they want to pay or, yes, it’s just maybe too hard to find the right equipment. Elijah: Yes, and then to perfect it. I think that’ll be phase two. We can create a widget but who knows how good. I’ve got some numbers that I think will work but ultimately until you put some in a can numbers don’t matter. Brendan: Right. Like you said earlier, a lot if testing, a lot of successes, a lot of failures. Well, cool. We’re coming up on the 30 minute mark here pretty quick. Any further thoughts on current state of nitro coffee and/or cold brew coffee, where it is now? Where do you think it’ll go in the next one to five years and maybe beyond? Elijah: Yes, so where it is now is it’s super popular as you know in the shops, and that’s really great. Where it’s going to go in the next five years, and it’s already starting to make its way there, is you’re going to be able, just like the rest of commerce, people don’t want to go to stores anymore, as I sit here, I can count five, six, seven laptops, and people are all on, I can see Facebook, or Amazon, or wherever else, people are going in and shopping online. That’s what the next five years looks like, and if we can’t get on that platform, this industry as a specific niche will die. So, that’s what we’re going to have to go in the next five years, and people are already doing that, Stumptown, Caveman, Chameleon; people are already doing these things, but it’s such a big scale, you have to order a big box, so the big step that will make us sustainable is when you can order a single bottle to your door. That’s what I see in the next five years, and we plan on here at Red Hat being on the front of that. We’ll be on Amazon by the end of this week. We already have a website that you can single purchase bottles and subscribe to bottles, and we plan on only making that better, and hopefully, within the next year or at the very latest 2017 have our Nitro Coffee on that same track. Brendan: Awesome. Well, I think that’s a good point to end on. You just mentioned that you’ve got a website. You want to share your website along with any social accounts that you may have where people can find you guys? Elijah: Yeah, absolutely. Like you said, we are here in San Diego, California. We go to, locally, at Farmers Market in Golden Hill, in UTC, and North Park. Then online, which I think is the best spot to get our stuff, you can go to redhatcoffee.com, and we have of course a little back story, and when you go into the shop, you can get a single purchase or subscription purchase. We’re on Facebook, Twitter, and Instagram, and all those handles are at @RedHatCoffee, and you can email us, or you can email me, [email protected] or just [email protected], which we’re kind of phasing out of. But yes, go check out the website, if you like it, if you hate it, let us know, both are super valuable inputs, and buy a bottle so you can get it out to you. Brendan: Awesome, sounds good Elijah. Thanks for joining us today. It was great to have you on, good to talk with you. Elijah: Thanks for having me, man. This is really, really awesome. I can’t wait to tell my dad will probably be pretty stoked that I’m on audio, and my mom will probably cry. Brendan: [laughs] That’s great, that’s great. Thanks for listening today. Make sure you go check out Elijah’s company Red Hat Coffee at www.RedHatCoffee.com, and while you’re there, order a bottle of Cold Gold, the flagship Cold Brew from Red Hat Coffee. That about does it for today. To find links and shownups for this episode, you can go to www.dripsanddraughts.com/5. As always, if you have any questions, email them to [email protected], or you can contact us on Twitter @ColdBrewAvenue. Would you or your coffee company like to be featured on a future episode of the show? Go to www.dripsanddraughts.com; click on be a guest on the show, and schedule an interview with us. Thanks again for listening. We’ll see you next Friday on Drips and Draughts.